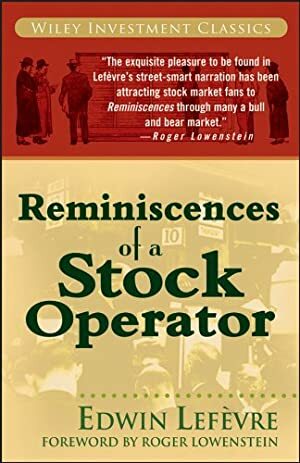 "Although Reminiscences... was first published some seventy years ago, its take on crowd psychology and market timing is a s timely as last summer's frenzy on the foreign exchange markets." "The most entertaining book written on investing is Reminiscences of a Stock Operator, by Edwin Lefèvre, first published in 1923." "After twenty years and many re-reads, Reminiscences is still one of my all-time favorites." "A must-read classic for all investors, whether brand-new or experienced." "Whilst stock market tomes have come and gone, this remains popular and in print eighty years on." First published in 1923, Reminiscences of a Stock Operator is the most widely read, highly recommended investment book ever. Generations of readers have found that it has more to teach them about markets and people than years of experience. This is a timeless tale that will enrich your life -- and your portfolio. Log In to track Edwin Lefèvre on eReaderIQ. to be notified each time the price drops on any book by Edwin Lefèvre. to stop tracking Edwin Lefèvre. Log In to track Roger Lowenstein on eReaderIQ. to be notified each time the price drops on any book by Roger Lowenstein. to stop tracking Roger Lowenstein. We started tracking this book on November 5, 2016. This book was $14.82 when we started tracking it. The price of this book has changed 44 times in the past 895 days. The current price of this book is $7.98 last checked one day ago. The lowest price to date was $2.99 last reached on May 19, 2018. The highest price to date was $14.82 last reached on November 5, 2016. This book has been $14.82 one time since we started tracking it. We last verified the price of this book about one day ago. At that time, the price was $7.98. This price is subject to change. The price displayed on the Amazon.com website at the time of purchase is the price you will pay for this book. Please confirm the price before making any purchases.